Home Reviews Brother HC1850: Is It the Best Quilting Sewing Machine Available? Sewing is a hobby many people undertake in their free time, however, for some, it's a full-time job. The Brother HC1850 sewing machine might be what you're looking for as a hobbyist or a professional seamstress. It is easy to use, can easily stitch through thick fabrics, and features several useful features for quilting. A sewing machine should be easy to set up, easy to operate and provide useful features. People who have a passion for quilting want sewing machines that can create distinct patterns. Ease of use and maneuverability are also important factors. A sewing machine must be durable, simple to work with, and ergonomic to make the experience enjoyable. Start picking out fabrics, patterns, and intricate stitching designs. The best sewing machines can handle complex patterns and seamlessly weave through thick materials with the slightest of ease. The computerized Brother HC1850 sewing machine provides users with several features to make quilting a cinch. The device helps to increase speeds and to maximize efficiency. An affordable price tag also makes it a desirable model for beginners who are learning to quilt and stitch. These are a few aspects that make the Brother HC1850 a great model for quilting. The sewing machine features 130 built-in stitching patterns. It also features eight, one-step buttonhole styles, and built-in sewing fonts. The device comes with a 25-year warranty and automatic needle threading. A full table and LCD screen make it easy to adjust settings. The bright light illuminates the sewing surface when owners sit down to begin sewing. The Brother HC185 has several distinct features for quilters. It has a full detachable table and spring action quilting foot. There is also a convenient, built-in stitch reference flip chart. This feature makes it easy for owners to choose the right pattern for the materials they're using. It has basic monogramming and can perform free-motion quilting. The machine is lightweight and portable, making it perfect for owners who work on the go. 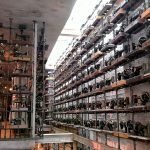 The computerized system puts owners in control. It features three different speed adjustment settings, for working with thin materials and thicker quilting materials. Users can adjust the width of the stitch patterns and length of each design. It also features an automatic needle threader. To replace the needle, owners have to use the needle position button below the speed control button. Using the screwdriver that comes with the toolkit, once the machine is off, allows owners to loosen the needle. The Brother HC1850 sewing machine is an excellent option for professionals and amateurs alike. It is an excellent machine for quilting. The product can easily handle thicker materials while sewing or stitching different patterns. It is great because it has several usability features to make quilting easy. It is also easy to adjust, making it great for quilting students or beginners learning how to sew. The machine is lightweight and easy to transport to multiple locations. So, for those who work from home and mobile sites, it's a great option. Like every product, the Brother HC1850 sewing machine has several great features, but it some drawbacks as well. These are a few of the good and bad that customers should consider when choosing a sewing machine. We reviewed the Brother HC1850 against other top quilting and stitching sewing machines. We considered the availability of stitching patterns, speeds, and settings on the device. Also, we included reviews of different products, to help customers decide which sewing machine is the best available. 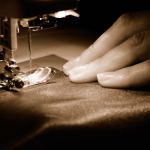 Our analysis also accounted for the materials the sewing machine can handle, and ease of use. The Brother HC1850 is available on sites like Amazon and Walmart among other online retailers. It is available on the company's website as well. The price of the sewing machine is $175 to $250, depending on where consumers purchase it. When comparing the best stitching and quilting machines, the Brother HC1850 is one of the many models available. These are a few top competitor models to consider when deciding which sewing machine to purchase. The computerized Singer sewing machine features over 600 stitch patterns. It also has an extension table and automatic pilot mode. The device is portable and easy to transport to different workstations. It also includes basic and decorative stitch patterns for owners to choose from while stitching. It has five alphanumeric settings and 13 one-buttonhole design settings as well. Mirror imaging and stitch elongation features are also present on this sewing machine. The machine is high speed, capable of achieving 850 stitches per minute. It features an automatic needle threader. Free-motion quilting and applique settings set this machine apart from competitors. Reviewers indicate the device looks great and has some great features. However, it falters frequently, and customer service isn't helpful. The owner claims after troubleshooting and restarting the machine, several stitching patterns weren't accessible. This machine costs $300 to $350. The machine has a 4.1 out of 5-stars rating on Amazon. 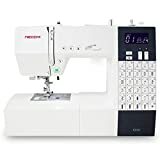 This computerized sewing machine is easy to use and has many simple user features for beginners. It is compact, and lightweight, making it easy to transport. The machine features an LCD screen, over 100 stitch patterns, an auto needle threader, and variable speed settings. It has a seven-point feed dog needle system. There is a variable speed override setting, to adjust for different fabrics. A bright LED light turns on when owners begin stitching. This feature allows owners to work in darker conditions. It has a standard zig-zag foot and satin stitch foot. The machine can sew up to 700 stitches per minute. It also includes a DVD to teach owners how to operate the basic features. A five-year warranty on mechanical defects and two-year electrical warranty come with the machine. The reviews for this machine are positive. However, one reviewer notes it's not the quietest machine while operating and is louder than several competitor sewing machines. The price of the device is $312 to $350. The Amazon rating for this machine is 4.7 out of 5-stars. This sewing and quilting machine features an extension table, backlit LCD, and advanced needle threading system. There are eight, one-stop buttonhole settings, and it can stitch up to 850 stitches per minute. There are 55 alphanumeric stitch patterns owners can set. 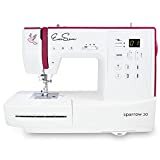 Variable speed settings, anti-jam capabilities, and basic monogramming functions make this sewing machine great for all skill levels. Fabrics feed through the machine smoothly, utilizing the seven-point feed dog system. One reviewer claims changing the needles on this machine was difficult and time-consuming to do. The needle placement is awkward, making it difficult to adjust when replacing with a new needle. The price of the machine is $180 to $200. This machine has a rating of 4.4 out of 5-stars on Amazon. This Janome machine comes with 22 accessories, an extension table, and has about 100 stitch pattern settings. It includes seven buttonholes, and convenient start/stop button. The sewing machine features easy threading and easy top-drop in the bobbin for quilting and thicker materials. The memorized needle, up/down system and interior metal frame, are both durable. The machine also has a memory function. Owners can save their favorite settings, and use these regularly when sewing on this machine. The adjustable thread tension is great when working with different materials. A backlit LCD screen is easy to operate and makes it simple to choose the perfect settings when sewing. There are 20 basic, 18 quilting, and 28 home decor patterns owners can set on the sewing machine. One reviewer notes issues with the foot peddler on this machine. They also indicate that after contacting customer service, they learned the 25-year warranty doesn't protect the foot peddler. For those who are looking for a professional or commercial grade machine, this is a great option. It is pricier than other sewing machines but has several great features that set it apart. It includes two plastic, 10-piece Neechi bobbins and two packs of assorted needles. The product has a top-load gathering foot, concealed zipper foot, and top-load ditch quilting foot. Owners can choose from many different quilting and sewing styles on this machine. The machine can quilt, sew, and is great for home DIY projects also. It has three, one-step buttonholes. There are also 30 built-in stitching patterns owners can set while sewing on this machine. The bright LED lighting makes it easy to see in dark conditions while working. There is an up-close magnifier, allowing owners to see what they're doing while stitching on the sewing machine. This feature helps increase visibility and accuracy in their work, especially on difficult stitch patterns. There are many advanced features on this sewing machine. It has a start/stop button and automatic thread cutter button. There's a built-in needle threader and memorized needle up/down setting. The maximum stitch length is five millimeters, and the maximum stitch width is seven millimeters. It includes a spool hole stabilizer plate and automatic buttonhole foot with the sewing machine. The price of this machine is $800 to $900. This item has not yet been rated on Amazon. This computerized sewing machine has a total of 80 different stitch patterns owners can set. It features a drop-in hook system. The device also has an LCD screen, making it easy to adjust settings while working on it. In addition, the start/stop button, the needle stop up/down, and LED lighting are nice features on this machine as well. There are a total of 10 quilting patterns, and 49 decorative patterns owners can set on the sewing machine. The maximum stitch width is seven millimeters and the maximum stitch length four and a half millimeters. The machine also features six one buttonhole settings to choose from on the device. It is capable of achieving up to 850 stitches per minute at the fastest speed settings. The machine is sturdy, weighing nearly 20 pounds. However, it is bulkier, and it isn't as transportable as other sewing machines in a similar class. One reviewer notes the quality of the sewing machine isn't as good as anticipated. They indicate for some fabrics it isn't sturdy and often moves when sewing. This design flaw causes errors in artistry and quality. There are several great quilting sewing machines available for people of varying skill levels. 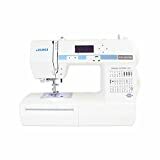 The Brother HC1850 is the best all-around machine for beginners, novice, and advanced quilters alike. It is lightweight and transportable. It has several great features, and hundreds of quilting patterns owners can set. The quilting speeds are quick and efficient, and the needle threader features several variable settings. Owners can rely on the bright LED backlit screen. This lighting makes it easy for them to use the machine in any light conditions. It can also handle thicker material fabrics, with monogramming functions, to complete various quilting projects. And, it is the most affordable machine on the list. The Juki HZL machine is an excellent option for those who want a higher-quality, professional-grade product. 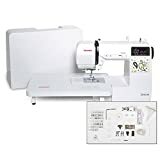 It features over 100 stitch patterns, LCD screen for easy adjustments, and standard zig-zag and satin stitch settings. It is efficient and is capable of sewing 700 stitches per minute. The sewing machine also comes with an introductory DVD to teach owners how to optimize their experience. Regardless of your skill level, there are several great quilting sewing machines available. These are a few of the best options for all budgets, and quilters at any stage of their quilting journey. The Brother HC1850 sewing machine is considered to be a good investment because of its excellent like computerized stitching, drop-in bobbin and threader and backlit controls and LCD. However, it can be a little too expensive for beginners and it's not suitable for longer work hours.